This time of year longer daylight and later sunset leaves me energized - a sunshine buzz, if you will. The glacier in my yard much of April is gone, lakes are open for business, humidity levels not too onerous, and bugs aren't doing back flips on the deck yet. At least we're alternating between spring and summer now. It's safe to remove the driveway stakes (and plant annuals). keep showers in town on Sunday, but ECMWF dries us out. Place your bets. try not to gripe about puddles, even on a weekend. Both NOAA and ECMWF models bring a potential tropical system into Florida by Memorial Day weekend. Tropical Storm Alberto, anyone? Rainfall Potential by Sunday Morning. The 00z run of NOAA's 12km NAM keeps the heaviest rain over the Dakotas and Nebraska, with significant 1-2" rains possible over west central Minnesota, but very little accumulation over central and southern Minnesota into Saturday. Map: pivotalweather.com. Steamy Late May - With a Few Exceptions. A stormy trough of low pressure over the Great Lakes and Ohio Valley may spark rounds of showers and T-storms with cooler-than-average temperatures. Otherwise much of the USA looks warmer than average within 2 weeks. Small Risk of "Alberto". Both GFS and ECMWF models continue to show a tropical wave or storm pushing into the eastern Gulf of Mexico by May 26, give or take. Confidence levels are low, but we should probably keep an eye on this. ECMWF forecast for Saturday morning, May 26 courtesy of WSI. America is Not Ready For This (Again). Any lessons learned from Harvey, Irma and Maria? Here's a clip from The New Republic: "...He says residents are more motivated to prepare their households for this hurricane season, but suggested the state could be doing more to prepare for the new normal: stronger, more frequent hurricanes. “There’s a longer range issue of how are we going to deal with all these areas that are prone to storm surge,” he said. “There’s a question of whether there should even be neighborhoods and local communities in some of these low-lying areas.” Instead of seriously grappling with those questions, however, most destroyed buildings in those places were rebuilt. 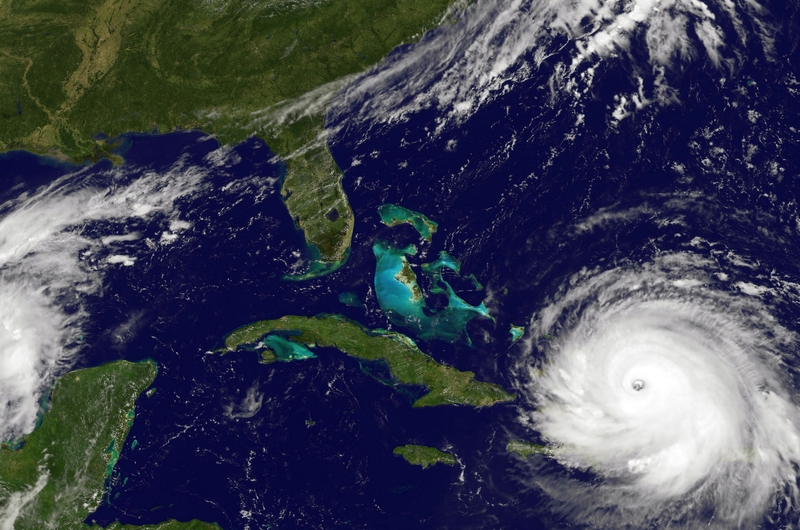 And last week, The Tampa Bay Times reported that the Florida legislature “failed to pass many of the bills they identified as essential” to lessening the damage from future storms. No bill was passed to address Florida’s decrepit sewage systems, which saw mass overflows after Hurricane Irma’s flooding—but a bill was passed to allow companies to dump treated sewage into drinking water sources..."
Will El Nino Emerge by Next Winter? We're due for the weather pendulum to swing in the other direction; details via Reuters: "The El Niño weather pattern, associated with warmer and wetter weather than usual that may give rise to damaging conditions, could emerge by the 2018-19 Northern Hemisphere winter, with neutral conditions expected to prevail through November this year, a U.S. government weather forecaster said on Thursday. The last El Niño, a warming of ocean surface temperatures in the eastern and central Pacific that typically occurs every few years, was linked to crop damage, fires and flash floods in 2016. The possibility of a transition to El Niño weather-pattern is nearing 50 percent by the 2018-19 Northern Hemisphere winter, the National Weather Service’s Climate Prediction Center (CPC) said in its monthly forecast..."
* Check out some amazing video of one of the German tornadoes here. 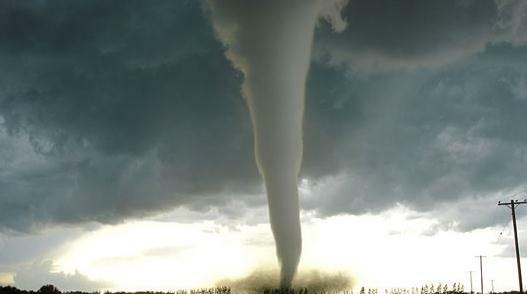 Listening to Tornadoes Could Revolutionize How Meteorologists Forecast These Monster Storms. USA TODAY explains some promising new technology: "We've all heard the description of what a tornado sounds like: The most common sound is a continuous rumble, like a nearby train. But twisters also produce noises that humans can't hear, and it's that sound, known as "infrasound," that experts say could revolutionize how meteorologists forecast tornadoes. Infrasound waves have frequencies below the range of human hearing that need special acoustic equipment to be detected. 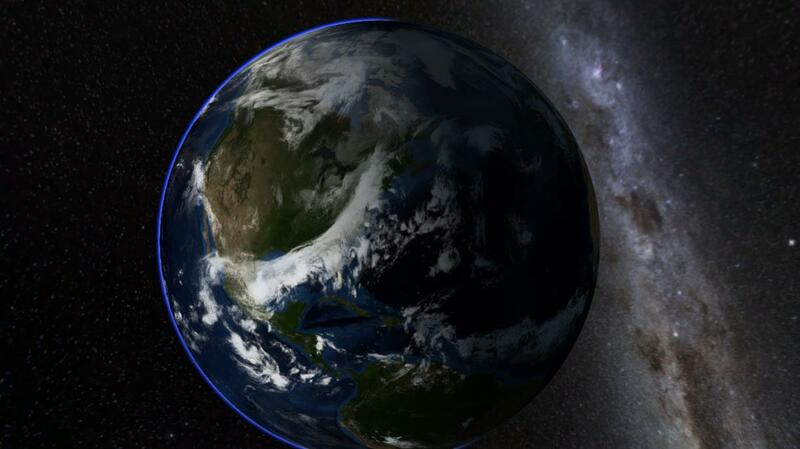 Other weather and geological phenomena, such as hurricanes and volcanoes, also produce infrasound. The theory goes that tornado-producing thunderstorms emit specific infrasound waves up to two hours before the actual tornado develops, which could be a big help in forecasting..."
Before the Next Flood, Protect America's Infrastructure. An Op-Ed at TheHill caught my eye: "...Flooding is the costliest natural disaster in the United States. It accounted for more than $268 billion in damage last year, a number that has risen steadily over the past two decades, and it affects the entire country, including areas well inland. Every state has experienced at least two major floods in the past 10 years. That’s why I’ve joined more than 250 state and local officials, representing all 50 states and more than 45 million Americans, in signing a statement of principles to make our infrastructure more flood-ready. We believe this can be done with policies that improve resiliency requirements for buildings and infrastructure; enhance the use of natural defenses, such as open green space and wetlands, in disaster preparedness; and reduce unsustainable development in high-risk areas..."
File photo: Walt Jennings, FEMA. Record Heat in the Gulf Fueled Hurricane Harvey's Deluge. KPBS explains the physics: "Hurricane Harvey, which devastated South Texas last August, was powered by what scientists say were the highest ocean temperatures they've ever seen in the Gulf of Mexico. Portions of the Gulf to the south of the Texas coast were 86 degrees Fahrenheit. That's several degrees higher than normal — and it's heat that drives big storms. Kevin Trenberth, an atmospheric scientist at the National Center for Atmospheric Research, says the extraordinarily high heat lasted for several days before the storm. "Record high ocean heat values not only increased the fuel available to sustain and intensify Harvey," he says, "but also increased its flooding rains on land." Warm sea surface temperatures create more water vapor, which rises into the atmosphere, then falls as rain during a tropical storm. Trenberth, writing in the journal Earth's Future, says measurements showing the amount of evaporation as the storm formed match the amount of rain that fell during the storm..."
Hurricane Harvey file photo: Andrees Latif, Reuters. Why Do People Believe in Weather Control Conspiracy Theories? Observer explains the psychology involved: "...People believe in weather control conspiracy theories for five main reasons. Money. It’s the single strongest factor behind the spread of conspiracy theories. If you search “chemtrails” or “HAARP” and look into the people and organizations pushing these conspiracy theories, the common factor is that they’re profiting from doing so. Not only do they reap ad revenue, but they often ask for donations or try to sell their readers products. There’s a clear financial incentive to convince people to believe their claims. People don’t want to believe that disasters are random. It’s terrifying to think that a tornado could sweep away your home with only a moment’s notice and that earthquakes can trigger tsunami waves that kill hundreds of thousands of people..."
China's Massive Plan to Control the Weather. Fox News has the eye-opening details: "China is setting forth to change the weather. According to Chinese media, the state-owned Aerospace Science and Technology Corporation of China has begun to turn just such a plan into reality. It’s starting work on producing thousands of rainmaking machines. These will be scattered across the Himalayan Tibetan Plateau. Each machine is supposed to be able to seed the sky in such a way as to produce a 5km-long storm-cloud on-demand. Put together, the weather-making array is intended to irrigate 1.6 million square kilometers with 10 billion cubic centimeters of water each year. That’s about the size of New South Wales and Victoria combined. They’ve done it before, on a smaller scale..."
White House, EPA Headed Off Chemical Pollution Study. POLITICO reports: "Scott Pruitt’s EPA and the White House sought to block publication of a federal health study on a nationwide water-contamination crisis, after one Trump administration aide warned it would cause a "public relations nightmare," newly disclosed emails reveal. The intervention early this year — not previously disclosed — came as HHS' Agency for Toxic Substances and Disease Registry was preparing to publish its assessment of a class of toxic chemicals that has contaminated water supplies near military bases, chemical plants and other sites from New York to Michigan to West Virginia..."
Photo credit: "Discussions about how to address the HHS study involved EPA Administrator Scott Pruitt's chief of staff and other top aides, including a chemical industry official who now oversees EPA’s chemical safety office." | AP Photo. America's Clean Power Map: Solar on Coasts, Wind Rules Heartland. Bloomberg published an interesting map; here's an excerpt: "Companies that sign long-term contracts to buy clean energy in the U.S. generally look to the heartland for wind power and to coastal states for solar. Wind blows best in places like Texas, Oklahoma and Iowa, and that’s where information technology giants like Alphabet Inc.’s Google and Amazon.com Inc. secure most of their power-purchase agreements for wind. California and, more recently, North Carolina, are among the top sources of solar..."
Why Traditional TV is in Trouble. Note to self: every industry is being disrupted by the Internet, outsourcing, automation, robotics and AI. Show me a "safe gig". The New York Times reports on the trends. Graphic courtesy of NYT and Magna. Flip Around the Channels. In This Town the News is Often The Same. Here's a clip from a Washington Post story: "The TV news has a familiar feel to it here in west-central Pennsylvania. News stories broadcast on WJAC, the NBC affiliate in town, have appeared on nearby station WATM, the ABC affiliate. And many of those stories are broadcast on WWCP, the Fox station here, as well. Not just the same topics — identical stories, reported by the same reporter or anchor, and repeated, almost verbatim at times, by the other stations. Recently, for example, both WATM and WWCP aired during their morning newscasts the same report about a Vietnam Veterans Day ceremony. Anchors at both stations used the virtually the same language to set up the story..."
What is Innovation in Local TV News? Andrew Heyward's New Mission Is to Find Out. Here are a couple of excerpts from an interesting interview at Nieman Journalism Lab: "...Social media is a major priority. My sense is that up to now, social media has been more of a promotional platform, a way to link back to TV, a way to link back to video segments that are kind of posted over to social. They’re using social media creatively for three things: story generation or finding stories, covering stories, and also for presenting stories for distribution. There’s a lot of room there for growth...Alongside what I’ll call traditional linear TV — the 5, 6, and 11 p.m. newscasts we have now — there’s going to be some sort of social- and mobile-based video journalism generated by these same stations. That is all still emerging. It’s a great question, because I don’t think we’re suddenly going to come up with some great gimmick and millennials are going to flock to their TV to watch traditional newscasts..."
How the Enlightment Ends. If you're not just a little bit paranoid about AI (artificial intelligence) you're not paying attention. Here's an excerpt from The Atlantic: "...But at that point, will AI be able to explain, in a way that humans can understand, why its actions are optimal? Or will AI’s decision making surpass the explanatory powers of human language and reason? Through all human history, civilizations have created ways to explain the world around them—in the Middle Ages, religion; in the Enlightenment, reason; in the 19th century, history; in the 20th century, ideology. The most difficult yet important question about the world into which we are headed is this: What will become of human consciousness if its own explanatory power is surpassed by AI, and societies are no longer able to interpret the world they inhabit in terms that are meaningful to them?..." Photo credit: Edmon de Haro. I Don't Know How to Waste Time on the Internet Anymore. A cry for help in this post at New York Magazine: "...In the decade since I took that computer class, the web browser has taken over the entire computing experience. There is nothing to “learn” about computers, really, except how to use a browser; everything you might want to do is done from that stupid empty address bar. Today, through that web browser, there are movies and TV shows and every song ever recorded; it’s where I do my writing and chatting and messaging; it’s where my notes and calendars and social networks live. It’s everything except fun. There is an argument that this my fault. I followed the wrong people; I am too nostalgic about bad blogs; I am in my 30s and what I used to think was fun time-killing is now deadly. But I don’t think so. What happened is that the internet stopped being something you went to in order to separate from the real world — from your job and your work and your obligations and responsibilities..."
Twin Cities No Longer Healthiest Metro Area in the USA. Bring Me The News explains: "...The Twin Cities was the healthiest metro area in 2017, but now Minneapolis and St. Paul are treated as separate cities. As a result, Minneapolis is now the 2nd fittest city in America, behind Arlington, Virginia. Still, 2nd is pretty damn good and when you consider that St. Paul is in 8th, it paints a picture of relative health for the Twin Cities. The index ranks America's largest cities using 33 health behaviors, chronic disease levels and local fitness infrastructure. 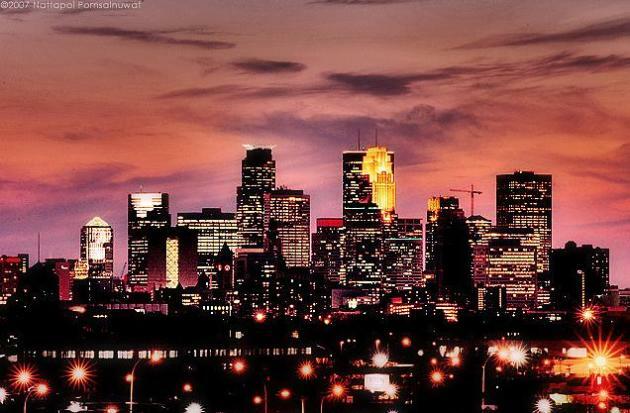 The Twin Cities scored well in most areas, while St. Paul ranked the highest in the nation for having the most baseball/softball diamonds per capita..."
Minnesota Has One of the Highest Depression Diagnosic Rates in the U.S., Study Says. Bring Me The News has the story: "This is one top 5 that Minnesota didn't want to make. Blue Cross Blue Shield has released a study of its own customer data that reveals Minnesota has one of the highest rates of depression diagnosis in the country. The state's 5.8 percent diagnosis rate was the 4th highest in the country, behind only Rhode Island, Maine and Utah. That is significantly higher than the national average rate of 4.4 percent, covering 9 million commercially insured Americans who have been diagnosed with major depressive disorder (also known as clinical depression). 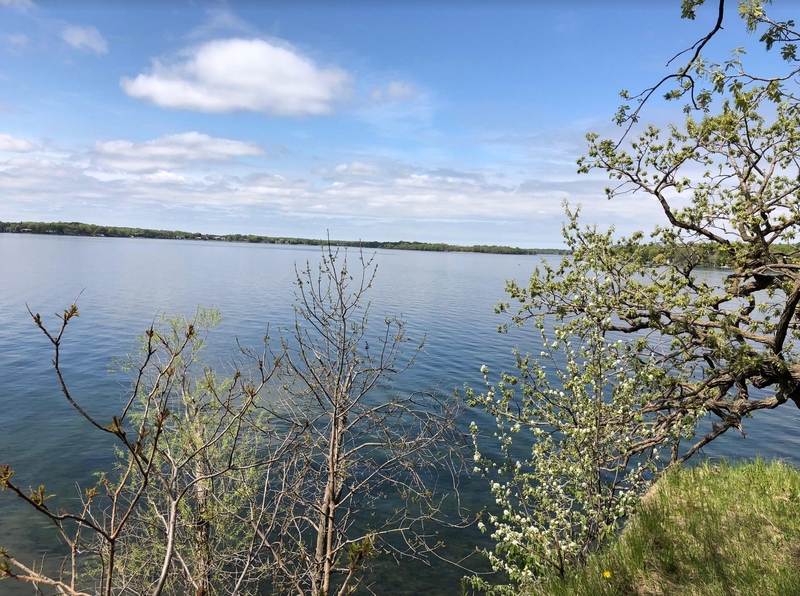 The rate of depression diagnoses among Minnesota women is at 8.1 percent – the joint highest level in the nation..."
87 F. high temperature yesterday in the Twin Cities. 69 F. average high on May 16. 84 F. high on May 16, 2017. May 17, 1915: Old man winter's last hurrah dumps 5 inches of snow along the western shore of Lake Superior. Most Americans Say Climate Change Affects Their Local Community, Including Two-Thirds Living Near Coast. Pew Research Center has the story: "Roughly six-in-ten Americans (59%) say climate change is currently affecting their local community either a great deal or some, according to a new Pew Research Center survey. Some 31% of Americans say the effects of climate change are affecting them personally, while 28% say climate change is affecting their local community but its effects are not impacting them in a personal way. As is the case on many climate change questions, perceptions of whether and how much climate change is affecting local communities are closely tied with political party affiliation..."
NASA Completes Survey Flights to Map Arctic Ice. Here's an excerpt of a post from NASA: "Operation IceBridge, NASA’s longest-running airborne mission to monitor polar ice change, concluded this year’s springtime survey of Arctic sea and land ice on May 2. The flights, which began on March 22, covered the western basin of the Arctic Ocean and Greenland’s fastest-changing glaciers.“This campaign achieved most of our primary objectives in surveying the state of Arctic ice," said IceBridge’s acting project scientist Joe MacGregor. “We’ve now flown many of these missions ten years in a row, a period that has included continued rapid change in both Arctic glaciers and sea ice." 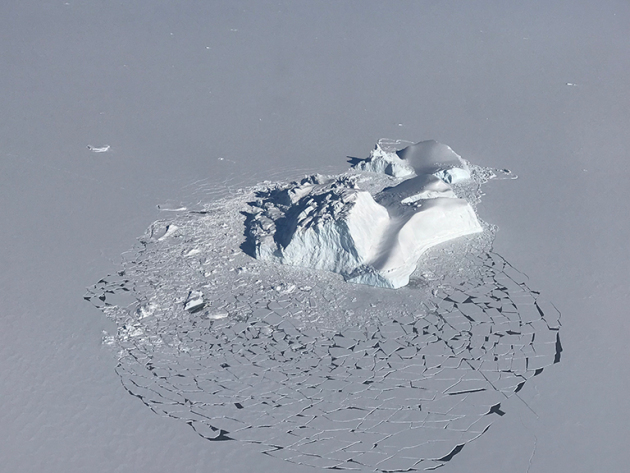 The image above was taken during a research flight carried out on April 21 near Vestfjord Glacier in Scoresby Sund, along the eastern coast of Greenland..."
Photo credit: "A large iceberg floating among sea ice floes, as seen during an operation IceBridge survey flight on April 21, 2018." Credit: NASA/Linette Boisvert. A Conservative Climate Change Speaker. My thanks to the people of River Falls, Wisconsin, who turned up to hear about climate trends and clean energy. River Falls is very much ahead of the curve, when it comes to sustainable, renewable power. Here's a clip from River Towns: "...The group was particularly interested in Douglas's perspective on climate change, Ostendorf said. River Falls United Methodist Church's pastor Amy DeLong agreed. "He did a great job of establishing himself as an Evangelical Christian, and as a conservative," DeLong said. "He did all that so he could get credibility with the people who are climate change deniers ... So he could say I'm one of you, but the evidence has lead me to the truth." Douglas said he's been giving talks about climate change and faith for about three years. "I've been trying to leave together science and faith and making the case that these two are not mutually exclusive," Douglas said. "Many people respond to science and data and some people, you know, seem to appreciate framing this in a way that appeals to people's heads and their hearts and their faith and spirituality, so that's what I'm trying to do..."
Linguistic Analysis Shows Oil Companies Are Giving Up on Climate Change. Quartz details the analytics that went into that headline: "...That’s where “corporate social responsibility” (CSR) reports come in. Issued annually by many large companies, these reports assess performance on measures that go beyond the bottom line, like environmental protection or human rights. Oil companies don’t have to release CSRs, but more than three-quarters of them do anyway. This is where they address the hairy issue of climate change, caused in no small part by their own products. It’s a topic they’d probably rather avoid, and increasingly, that’s exactly what they’re doing. These companies are mentioning the phrase “climate change” less and less in their social responsibility reports, as the chart below shows. It’s the result of a new paper by Sylvia Jaworska, a linguist at the University of Reading in the UK..."
The Female Scientist Who Identified the Greenhouse Effect Never Got the Credit. Quartz explains: "John Tyndall, an Irish physicist, is usually recognized as the first person to prove the greenhouse-gas effect. But some of the credit should have gone to Eunice Foote, an American scientist, who, save a few mentions, remains largely unknown today. To correct the scientific wrong, the University of California-Santa Barbara (UCSB) is organizing an event titled: “Science knows no gender? In search of Eunice Foote, who 162 years ago discovered the principal cause of global warming” on May 17. Foote’s story was first brought to light by Raymond Sorenson, an independent researcher, in 2011. Since then, UCSB researcher John Perlin has unearthed more details..."
How do Scientists Know that Mauna Loa's Volcanic Emissions Don't Affect the CO2 Collected There? Here's an excerpt of an explainer at NASA's Earth Observatory: "...Most of the time, the observatory experiences “baseline” conditions and measures clean air which has been over the Pacific Ocean for days or weeks. We know this because the CO2 analyzer usually gives a very steady reading which varies by less than 3/10 of a part per million (ppm) from hour to hour. These are the conditions we use to calculate the monthly averages that go into the famous 50-year graph of atmospheric CO2 concentration. We only detect volcanic CO2 from the Mauna Loa summit late at night at times when the regional winds are light and southerly. Under these conditions, a temperature inversion forms above the ground, and the volcanic emissions are trapped near the surface and travel down our side of the mountain slope. When the volcanic emissions arrive at the observatory, the CO2 analyzer readings increase by several parts per million, and the measured amounts become highly variable for periods of several minutes to a few hours. In the last decade, this has occurred on about 15% of nights between midnight and 6 a.m..."
Dismal Western Snowpack is a Climate "Warning Sign". Talk about weather (water) whiplash. Scientific American has the post: "...And as of this month, much of the Colorado River Basin was seeing snowpack at levels less than 50 percent—and in some places less than 25 percent—of their typical averages. The implications, even for a single season, are concerning. Snowpack from the Sierra Nevada supplies about 30 percent of California’s water resources as it melts in the spring and summer. And the Rio Grande and Colorado River, both fed by runoff from the Rocky Mountains, each supply drinking water for millions of people. Additionally, spring runoff helps to moisten and recharge the soil—shortages can stress the local vegetation and cause the landscape to dry out faster, potentially increasing the likelihood of earlier and more severe wildfires..."
Image credit: SSEC, University of Wisconsin. Toxic Algae Blooms Occurring More Often, May Be Caught in a Climate Change Feedback Loop. InsideClimate News has the report: "...Blooms of harmful algae in the nation's waters appear to be occurring much more frequently than in the past, increasing suspicions that the warming climate may be exacerbating the problem. The Environmental Working Group (EWG) published newly collected data on Tuesday reporting nearly 300 large blooms since 2010. Last year alone, 169 were reported. While NOAA issues forecasts for harmful algal blooms in certain areas, the advocacy group called its report the first attempt to track the blooms on a nationwide scale. The study comes as scientists have predicted proliferation of these blooms as the climate changes, and amid increasing attention by the news media and local politicians to the worst cases..."
Image credit: "A satellite image captures algae blooms in Lake Erie in 2011. Toledo, Ohio, is at the southwestern tip of the lake." Credit: European Space Agency. Older and Younger GOP Voters Don't Agree on Climate Change. The Energy 202 at The Washington Post explains: "According to a new survey released by the Pew Research Center on Monday, millennial GOP voters, those born between 1981 and 1996, disagree with their older partisan counterparts across a range of energy and environmental issues. Younger Republicans disagree with their older partisan counterparts on the extent to which climate change is already affecting the world.This new survey, and others, suggest that tomorrow's Republican Party, writ large, will think and talk about climate change in a starkly different way from today's GOP — whose leader, President Trump, along with many Republican members of Congress, have repeatedly dismissed the findings of climate science as a hoax..."
Younger Republicans Are Slightly More Liberal on Climate Change. Here's a clip from The Atlantic: "...The second bit of intriguing news comes from the poll’s dive into generational attitudes in the Republican party. Millennial Republicans are more likely to endorse centrist environmental positions than their Boomer or Gen X co-partisans, the study found. More than a third of Millennial Republicans agree that the “Earth is warming mostly due to human activity,” as compared to 18 percent of Boomers and older generations. Almost 60 percent of young Republicans say that climate change is having “at least some effect on the United States,” and 45 percent see it active in their community. Nearly half of millennial Republicans say the government is doing too little to “reduce effects of climate change,” as compared to 27 percent of Boomer Republicans, the study found..."